Anyway, during one of my visits to Paper Lovestory, I happened upon Angela’s review of Daycraft’s Animal Pals notebooks. (The expression on the chameleon’s face just kills me). So, out of curiousity, I clicked over to Daycraft’s website for a look at their other merchandise. Since I’m obsessed with all things related to bread, one of the first items that caught my fancy was the bRead notebook. 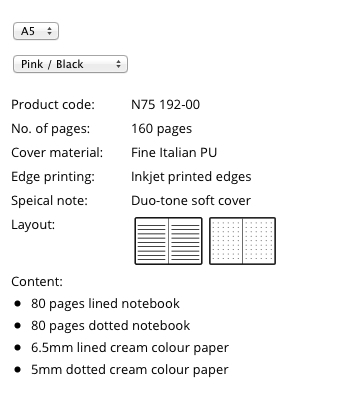 From the product specifications listed on their website, the notebook includes two types of layouts (lined and dotted paper) so the lined section would be perfect for meeting notes, and the dotted section would be just right for blog notes, which honestly sometimes begin as a random hodgepodge of scribbles and arrows. Check out Daycraft’s website here: http://daycraft.co (and now I’m deeply tempted by their cookie bookie notebook) According to their website, Daycraft is available for purchase at Eslite bookstores in Taiwan.